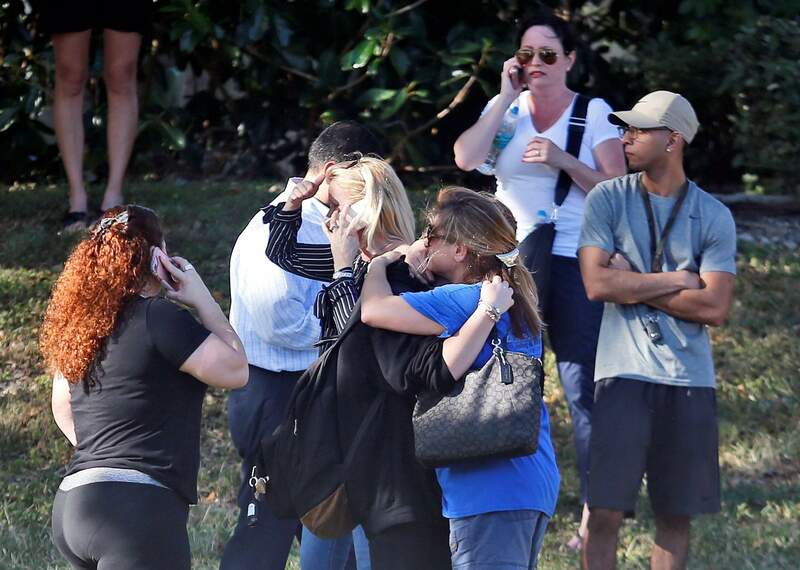 Anxious family members wait for news of students as two people embrace on Wednesday in Parkland, Fla. A shooting at Marjory Stoneman Douglas High School sent students rushing into the streets as SWAT team members swarmed in and locked down the building. Police have taken the person suspected of opening fire at a south Florida high school into custody, Broward Sheriff’s Office said. The shooting was reported shortly before students were let out of class Wednesday afternoon. Police had fanned out across the school searching for the shooter as students and teachers remained barricaded in classrooms. There were multiple people killed in the shooting, Robert Runcie, the superintendent of Broward County schools, told reporters at the scene. Runcie said officials did not receive any threats he was aware of made before the shooting. At least 20 people may have been injured, but that number may be as high as 50 people, according to Dan Booker, a fire chief from a nearby city. Some of those injured are students who were shot, Booker said. “It’s still an active scene,” he said. Booker said he is seeking aid from the Coast Guard and other agencies because many victims will need to be transported by helicopter. Police from nearby Coral Springs, who were also responding to the incident, urged students and teachers to remain barricaded inside the school. Law enforcement officials said they were clearing students building by building. The school, which opened in the early 1990s, had more than 3,000 students in the 2015-2016 school year, according to federal data. Gov. Rick Scott, R, said he had been briefed by the Broward County sheriff, whose agency was leading the response, as well as by the county’s school superintendent. President Donald Trump was notified of the shooting, Deputy Press Secretary Lindsay Walters said. “The president has been made aware of the school shooting in Florida. We are monitoring the situation. Our thoughts and prayers are with those affected,” Walters said. The Broward County school system wrote in a message on Twitter that students and staff “heard what sounded like gunfire” close to the school’s dismissal time. A representative for the Broward Sheriff’s office declined to discuss the number of people injured and said that office would release information only when they have confirmed it.